My girlfriend hates going to the movie theater, so in my case "Guardians Of The Galaxy" had to take a backseat to the "Teenage Mutant Ninja Turtles" reboot. I've heard Marvel's latest big screen adaption is PHENOMENAL, not only from online reviews, but from friends of all ages. 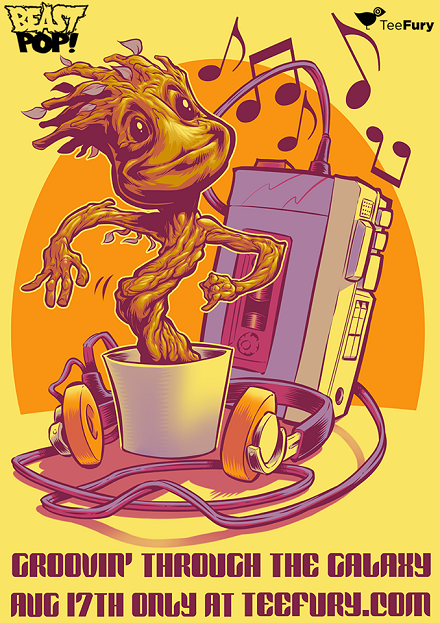 What I have seen, though, is the funky dancing Groot clip that has been all over the internet. BeastPop captures this adorable scene in "Groovin' Through The Galaxy." It's for sale today only, 08.17.14, through TeeFury for just $11, with three color options to boot. UPDATE 08.18.14 You can now purchase this design through BeastPop's TeePublic shop.